Yesterday, I did something way out of the ordinary for me. I sat down and listened to a hip-hop record from start to finish, for maybe what was the third time in my entire life. How am I following that up? With a freakin’ swing album. You know that music that Frank Sinatra played? Well apparently, people are still making it. Yeah, I had no idea either. Stepping out of my little indie comfort zone has been weird. The even stranger thing is, I actually like it. For one, it is definitely keeping me away from another feedback-reliant indie rock album. Thank god. Perennial Favorites really does sound like it came straight out of the 30’s. Everything about this record, from the big horn sections to the old-timey vocals, sounds of that era. 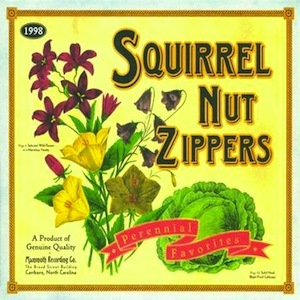 Even the band’s name, Squirrel Nut Zippers—a candy made during the period that the group is emulating—sounds old for some reason. Honestly, I kind of thought that I liked this record for the novelty of it at first, which wasn’t unreasonable, as I really have never heard anything quite like Perennial Favorites before. It’s impossible to tag with any specific genre, and that is what I liked about it at first. After I finished the album, though, I realized that I never really lost interest in what I was listening to. So that means either that I’m easily amused by weird things, or that Squirrel Nut Zippers actually did put a really solid record together, as unconventional as it may be. I’m hoping it’s the latter.